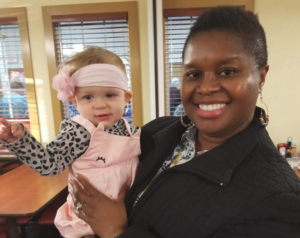 Hannah Marie Jarvis was eating dinner with her family on Thanksgiving Day in a North Carolina Golden Corral restaurant when every parent’s worst nightmare happened: her child started choking. 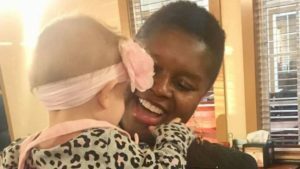 Hannah, the mother of 7-month-old Calli, said that her daughter had been eating mashed potatoes and suddenly was not able to breathe. All of a sudden, everyone was panicking and a waitress called for help. Hannah posted a photo of her baby with Debra after she saved the girl’s life, hoping that someone in the area would know who she was. She also made sure to give a thank you to Trish, the Golden Corral employee who quickly intervened and got help for baby Callie. “I will never forget the many tears that were shed today in Golden Corral as this angel stepped in to perform the Heimlich maneuver that saved my baby from choking to death,” Hannah wrote. The story has a heartwarming ending, as Debra Rouse found the post and commented herself. “I knew God was with us and I’m so thankful that he had me in the right place at the right time,” wrote Debra, who is listed as a pastor on her social media profile.